Shanghai Arts and Crafts Factory is committed to providing enjoyable handicraft and high value-added design services. In recent years, it undertook a large number of design projects such as art floats and lights, gold and silver products, jewelry, packaging, and more. It also worked with many other well-known brands such as Laofengxiang, a very famous local jewelry maker. 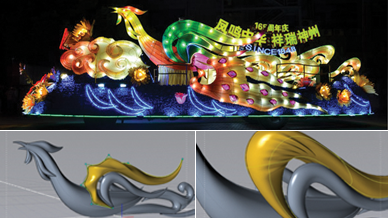 In the past, using 2D drawing software such as Photoshop to represent ideas was always the first choice of Shanghai Arts and Crafts factory’s designers, especially for float design projects. Designers could quickly draw a main view of the float with dimensions, and then transfer it to the float makers. However, the Shanghai Arts and Crafts factory found some challenges with this process. Normally with just one side view, it was hard to explain all of the intricate details. Designers had to communicate each detail to the manufacturer and discuss several times. Adding another view of the drawing created in Photoshop would take additional time. While searching for a new tool to improve this process, the Shanghai Arts and Crafts factory learned about Evolve. Evolve provides a very unique NURBS-based environment for designers. The Construction Tree function allows them to generate many alternatives with just one model. 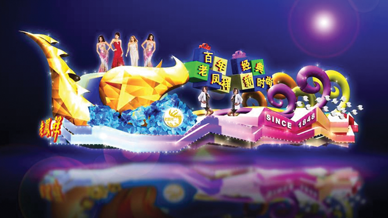 While designing a unique phoenix float project, designers were able to create three different concepts within a few minutes. “I’ve never had such smooth experience for playing with my design,” noted creative director, Wang Bufei. Prior to using Evolve, designers used color gradients to get stereoscopic effects in Photoshop. However, they found that it’s often not realistic enough and required large amounts of time to draw. Thanks to Evolve’s built in rendering engine, designers can greatly optimize their traditional workflow. Firstly, they render floats in Evolve with the materials and models library presets. This rendering process can be completed in just a few minutes to generate an image with the correct light/shadow effects. With this rendering image as a “baseline”, designers then use Photoshop to add more details, such as flowers, models, light halo, etc. In this new workflow, designers can use the superiority of each kind of tool (both 2D and 3D) to quickly get the best effect. Finally, Evolve can convert 3D models to dimensional drawings in the same work environment, making the workflow smooth and reasonable. Wang Bufei said: “Evolve is a perfect conceptual design tool for us. It is very easy to learn and helps us generate many ideas efficiently. After first using Evolve, we couldn’t give it up.” The Shanghai Arts and Crafts factory is not only using Evolve for float designs, Evolve is also used by the company for many other projects, like package and jewelry design. Advance past current 2D drawing approach into full 3D models and renderings. 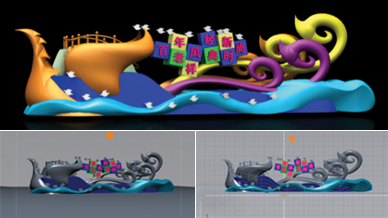 These designs and renderings are then shared with float makers prior to manufacturing. 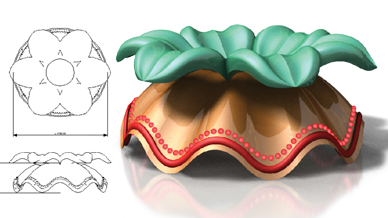 A process incorporating Evolve is used to generate ideal designs and renderings. Evolve provides a smooth and efficient way to explore multiple alternatives. 3D models created in Evolve can be reviewed from each view, which helps designers explain their design very clearly. Easy integration with current design tools such as Photoshop for ideal rendering effects. Dimensional drawings help increase the efficiency of the float building process. Headquartered in Shanghai, China, Shanghai Arts and Crafts Factory is a state-owned leading maker of arts and handicrafts that has over 20 years of history. It is committed to providing enjoyable handicraft and high value-added design services. Its business covers art floats and lights, gold and silver products, jewelry, packaging and more.